The satisfaction of a close victory secured. 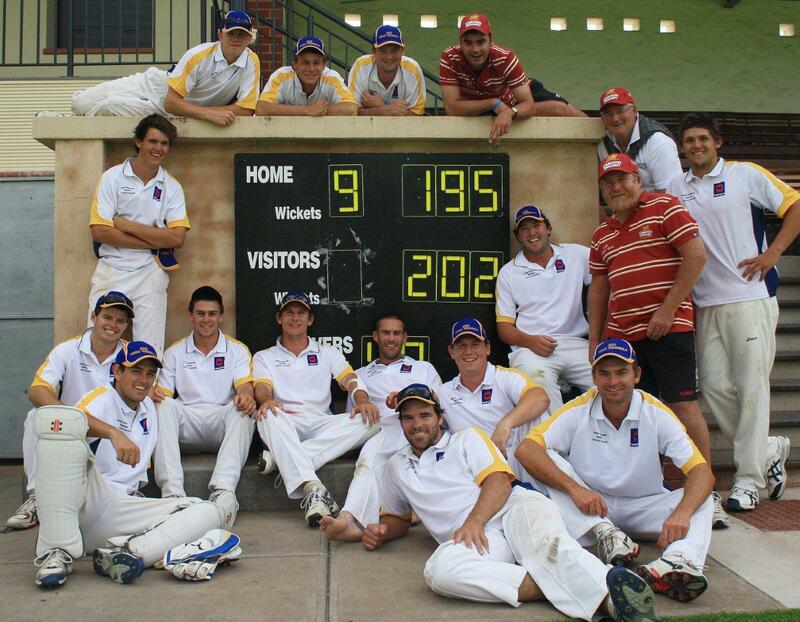 The victorious Yorke Peninsula side more than happily pose by the modest portable scoreboard after the 2012 senior South Australian Country Cup final at the famous Adelaide University Black’s number 1 ground, just north of the Torrens River. YP made a competitive total of 202, with captain and former SA Outbacks cricketer Adam Pitt top scoring with 44, while former Crows rookie-listed footballer James Moss made 37. In the Fleurieu and Districts run chase, Dylan Brown made an accomplished century and at 4/141 Fleurieu and Districts were looking in control of the contest. But the last six wickets fell for 54, largely due to all round rural sporting talent Ryan Darling taking three late order wickets including the final victim. The fall of the last wicket sparked riotous celebrations by the YP boys. Peter Argent’s previous contribution to Scoreboard Pressure was Adelaide Oval milestones.